ABOUT THIS PRESS CONFERENCE: Following the Beatles' performance at the Hollywood Bowl on August 30th, the group traveled to San Francisco. Their concert at Cow Palace would be the 10th and final stop of their 1965 North American tour. 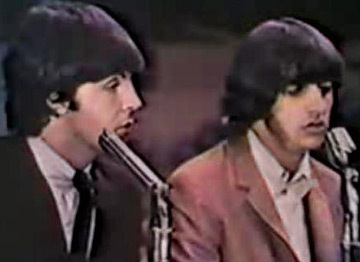 The following press conference was held from the stage at Cow Palace between the Beatles' matinee and evening concerts. Upon the conclusion of the current tour of America, the Beatles would return to England for a month's break. During this time, John and Paul would finish songwriting and Ringo would become a father for the first time. On October 12th, the Beatles would begin the sessions for their next album, Rubber Soul. Q: "Is Ringo going to continue acting? There's a possibility that he would be an actor if he dropped out of the Beatles." GEORGE: "There's a possibility he wouldn't be, as well." GEORGE: "There's a film contract for 'The Beatles,' and if he dropped out he wouldn't be in it, would he?" RINGO: "No, I wouldn't be of any interest, you know. Who wants to see nobody?" Q: "What is the closest you have come to losing life and limb?" JOHN: "Someplace in New Zealand... and I think Houston." GEORGE: Well, just generally, Texas, you know. Whenever we go to Texas we almost get killed, because they're too busy guarding the oil down there, you know." Q: "What is the best city you've performed in?" JOHN: "For sound -- Atlanta, because they had a proper microphone system. And all the people that were there could hear us as well as scream, you know." GEORGE: "And it was a bigger place, too." JOHN: (childlike taunting) "Hee-hee Hee-hee!" Q: "How does San Francisco police security compare with other US cities?" PAUL: "They just... There just wasn't enough, you know, I don't think. (jokingly gesturing to the reporters area) So, they should've been able to handle all this kind of thing, right?" GEORGE: "The thing is -- it's unfair on the police who do come, because you know, there's not enough of them, and they've got to do twice as much as... you know, don't they?" Q: "Do you dread this next concert?" 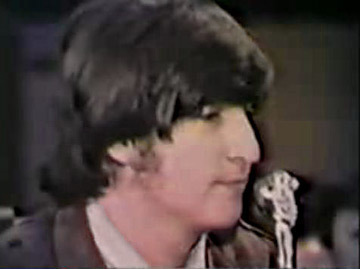 JOHN: (jokingly to the reporter) "That's forty questions you've had." M.C: (repeating) "Do you dread this next concert?" RINGO: "No, no, no. Do you?" Q: "Did you get to see much of Los Angeles last week?" JOHN: "We weren't trying, really." RINGO: "We just stayed in, you know." Q: "Do you get to see much of any city that you visit?" Q: "Do you want to?" JOHN: "We don't expect to. I mean, we're working here. I mean, if you're at work in an office, you don't see much of the surrounding places. And it's the same for us, we don't expect to see it. If we're still alive, we'll come back when we're forty and have a look at the places that looked interesting. Last time, Ringo and I went out when we came in, it looked great. We were out in some club somewhere, I can't remember where it was, you know." Q: (female) "It was the Rickshaw." PAUL: "I mean, everyone says it's a good place, you know. But we haven't seen much of it." JOHN: "And that road we were going over the water looks good. You know, that's about all we see." Q: "...people throw anything? Were you physically afraid in terms of real violence this afternoon?" PAUL: "You know, when you get things like shoes thrown up on stage, you've got to be a bit physically afraid for your eye or something, you know, 'cuz you could lose it. Right?" JOHN: "And I don't wanna lose me contact lenses, either." Q: "There have been recent reports out of England that... groups should make less use of electronic amplification. How do you feel about this?" 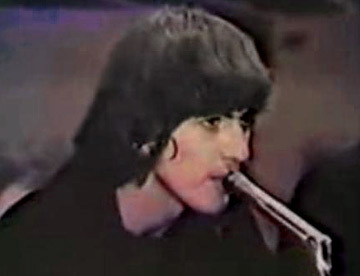 RINGO: "Well, no one would be able to hear a thing, you know." JOHN: "You can't even hear a symphony orchestra -- they've all got something." GEORGE: "The whole point of rock and roll music is electronic sound." JOHN: "And if you don't wanna use it, you don't wanna use it for TV. Just keep going to the music hall. You know, it's just a ridiculous... It's just stupid, you know." Q: "Have you opened the presents you got from the fans at the airport today?" GEORGE: "You mean the sweaters?" PAUL: "Yes. The... uh... the thingies?" RINGO: "We couldn't decide what they were, can you tell us?" RINGO: "They look like nighties to me, you know." Q: "And what is your impression of lack of privacy during the US tours?" RINGO: "Well, we... you know. When we do a tour we expect to have no privacy, anyway. We have plenty when we're off. You know, so you just take the good and the bad. We have a good time." M.C: "Last question. Very last one." Q: "If you were not singers, what would you like to be?" JOHN: "Just rich, I think." M.C: "Right, we do have to bring the conference to a close because they're waiting to open the doors for the second show." GEORGE: "Thank you very much."